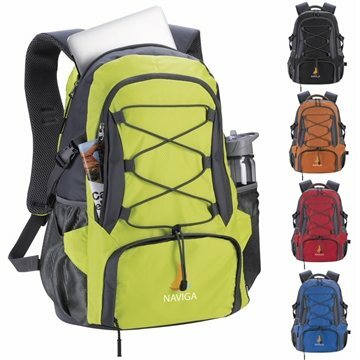 This outdoor backpack comes with all the bells and whistles. With multiple zippered pockets and the bungee cored feature, you can pack all of your necessities for the day! Large main zippered compartment with laptop sleeve. Two front zippered pockets and two side mesh pockets. Bungee cords attached to the front to help hold larger items. Padded mesh back and padded adjustable shoulder straps.